(Nanowerk News) The imaging performance of today’s generation of Transmission Electron Microscopes (TEMs) is improved dramatically through the use of a novel technique, the thin film phase plate. JEOL is the only electron microscope supplier to offer commercially-available thin film phase plate technology to its Life Sciences customers, in particular those involved in cryo-electron microscopy and cryo-electron tomography. The phase contrast imaging capability of a phase-plate outfitted JEOL TEM increases specimen contrast by orders of magnitude. While phase plate technology - invented by Frits Zernike and awarded the Physic Nobel prize in 1953 - is an accepted tool for live-cell imaging with the light microscope (LM), it is a novel approach to imaging with the TEM. Similar to the LM application, the TEM application employs a -phase plate that shifts the phase of only the scattered electrons, resulting in amplitude contrast rather than phase contrast as these electrons interfere with the unscattered electrons in the image plane (See Fig. 1). Fig. 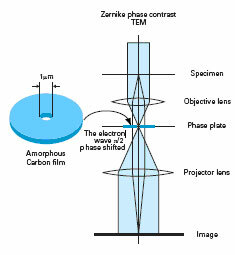 1 Schematic outline showing the principle of Zernike phase plate imaging. Scattered electrons from the specimen pass through the phase plate where their phase get shifted by π/2. The unscattered electrons are focused in the back-focal plane and pass through a 1-µm diameter pinhole. The interference of the electrons in the image plane gives rise to amplitude contrast. “Nearly perfect phase-contrast specimens, like frozen-hydrated samples, can now be imaged with superior contrast, which greatly benefits studies where the image contrast is a limiting factor, such as single-particle imaging and tomography.” says Dr. Jaap Brink, JEOL’s TEM Product Manager. Thus, the phase plate imaging technique stands to have a huge impact in not just the academic field, but also in the field of applied sciences, R&D, or every field where cryo-imaging is being used. Extensive research has led to the further development of phase plate technology at the laboratory of Prof. Kuniaki Nagayama, Director & Professor of Okazaki Institute for Integrative Bioscience in Japan. Prof. Nagayama and his colleagues have illustrated the potential for routine phase contrast TEM imaging of frozen-hydrated macromolecules. Using custom software they have applied the phase plate imaging successfully to cryo-tomography (See Fig. 2). Fig. 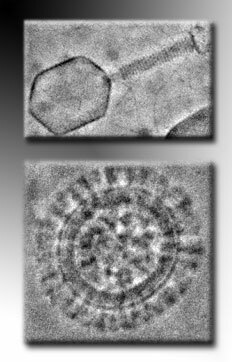 2 Images of frozen-hydrated T4 phage and influenza A virus courtesy of the laboratory of Prof. K. Nagayama, Okazaki Institute for Integrative Bioscience, Okazaki, Japan. JEOL’s TEM columns are optimally designed for phase contrast cryo-electron tomography, as they are unsurpassed in the ability to customize the imaging parameters without sacrificing ease of use. Furthermore, developments have led to continuously heated phase plate holders with piezo drives and software for precise positioning of the phase plate and zero loss energy filtering through an in-column Omega filter. Within the past few months, JEOL USA has seen an increase in orders for its biological TEMs, especially its 200 and 300 keV models. Collaborative partnerships between these researchers and JEOL USA are aimed at maximizing the efficacy of the phase plate technology. JEOL USA, Inc., a wholly owned subsidiary of JEOL, Ltd., Japan, was incorporated in the United States in 1962. The company has 13 regional service centers that offer unlimited emergency service and support in the U.S.